DLCPM Online was designed to empower smaller laboratories with the tools and technology that will encourage accountability, organization, and growth. In one easy to use a secure system, enjoy the features of a complete solution providing access to customer account information, call tracking, case scheduling and tasks, sales and accounting data completely independent of your operating system or browser. This new web-based system is built on proven DLCPM technology and methodologies currently utilized by laboratories worldwide and can elevate your customer service and production efficiency to new levels. DLCPM Online comes ready to market to new accounts, analyze case production, sales, and financial data, monitor technicians, invoicing, statements, and much more. These features will help your laboratory optimize production processes while providing your doctors complete customer satisfaction. DLCPM Net was designed to empower smaller laboratories with the tools and technology that will encourage accountability, organization, and growth. In one easy to use secure system, enjoy the features of a complete solution providing access to customer account information, call tracking, case scheduling and tasks, sales and accounting data completely independent of your operating system or browser. This new web based system is built on proven DLCPM technology and methodologies currently utilized by laboratories worldwide and can elevate your customer service and production efficiency to new levels. DLCPM Net comes ready to market to new accounts, analyze case production, sales and financial data, monitor technicians, invoicing, statements, and much more. These features will help your laboratory optimize production processes while providing your doctors complete customer satisfaction. Unlike other web based lab management solutions, with DLCPM Net you have the choice to install the software on your own hardware or have Magic Touch host your installation in a secure data center. There are never any per case or customer transaction fees. Simply pay per user. That means one low rate you can count on starting at just $119 per month. There are no long term contracts to sign to get started. DLCPM Net provides the ultimate in flexibility and scalability. As you grow your business and may decide down the road that our Enterprise solution is more suited for your needs; no problem! We can easily upgrade your Net installation to Enterprise and move it to your own hardware or continue to host your data for you. With DLCPM Net you always have options! Already using Quickbooks for your Lab’s accounting needs? No need to start over. We can preserve all Quick book data that you have been accumulating. In addition, although Dental Lab CPM Enterprise does contain a full Accounts Receivable module built in, users will enjoy the flexibility to choose Intuit’s Quickbook as the preferred accounting solution. Applying invoices and payments to your existing Quickbooks database has never been simpler with built -in integration with Intuit Quickbooks. Enjoy the look and feel of Quickbook’s accounting system or the ease of one system while DLCPM posts invoices and payments to Quickbooks. You decide! Take advantage of a completely built-in Accounting tools in DLCPM or utilize Quickbooks to accurately maintain account balances, process accounts receivables, and monthly statements for all of your customers with this powerful integration. Choose what’s best for your lab! Dental Lab CPM makes it easy to accept payments via credit card. We currently support check and credit acceptance services with Marathon, Authorize.Net, First Data, eMerchant (New Merchant), Card Connect, Payscape, and Payeezy. Use an existing account or create a brand new one, the system can be configured to post payments and credits safely and securely. If requested by the customer, there is an option to save the credit card number in an encrypted format in the system. DLCPM can reprocess those credit card payments that may have previously failed. All of these credit card transactions are made available for viewing with just a few clicks for any given Customer on the Accounting Page or in one central list. We have also included reports presenting Successful and Failed transactions for any given time frame. Tired of wondering who are your top accounts? Top selling Departments? Top Selling Products? Based entirely on real time production data, this sales information can be broken down by sales, remakes, credits, and further categorized by product types, product groups, and departments. At the same time, DLCPM makes it easy to follow up with delinquent accounts presenting all billing activity ranging from current monthly balances to 90 days past due to payment information. You will wonder how you ever did it without this powerful up-to-date info on what matters; Sales, Credits, and Remakes. The Sales Data page has been revamped to include Extended Sales figures for all available years. The new design and layout neatly organizes last year’s four Quarter Sales, Remake and Credit as well as the last year four Quarter percentages for Sales, Remake and Credit. With just a simple click, it is even possible to view last year’s Sales, Remake and Credits broken down by each month. In seconds, you know exactly how much business customers have done with your laboratory. Using streamlined processes and intuitive interfaces, using the DLCPM system for case management has never been easier or faster. Case Entry is the first and perhaps the most important step in production. Based on any product codes and descriptions your lab chooses, employees can easily enter all pertinent case information including Product Code, Tooth Numbers, Materials, and more while minimizing errors through built-in data validation rules. Once the case is entered in the Dental Lab CPM system, the case is automatically scheduled and all tasks are created based on the product code(s) and the method of fabrication. Dental Lab CPM gives the ability to easily configure each product for specific production and scheduling methods, ship date calculation, and descriptions among others. In addition, each task can be customized to include duration, pay rate, technician assignment, QC tasks and other pieces that are pertinent to your lab. We can help you easily mold the software per your lab’s requirements to coincide with your lab processes and align technician tasks and work flows in the most efficient way possible. Part of the Case Tracking available in DLCPM is the ability to set the location of a case based on important areas of your laboratory or a specific technician’s work bench. For example, if a case has to be sent to a call center due to a need to contact the doctor, DLCPM allows you to scan the Case Number and update the case location as “Call Center” with the current date and time and of course is instantly viewable by all users. Alternatively, the case may be going to the plaster room to be worked on by a certain technician. DLCPM makes it just as easy to update a case’s location by a technician’s bench number or location as well. In addition, you can easily view any edits that may occur throughout the life of the case in the lab including changing the due date, shipping method, reschedule, etc. This feature will take the guess work out of locating a case at any given moment or understanding who made a change to the case entry anywhere anytime in your laboratory. DLCPM comes equipped with a fully functional Work Order that contains all pertinent information needed to manufacture the case in your laboratory. See some things you may want to add to the work order or want to move some things around? Not a problem. For a small fee, our experts will be glad to work with your lab to help design your ideal Work Order. Doctors continue to include important materials when sending the case to your laboratory. DLCPM provides a means to successfully track all of the various materials such as bites, pictures, articulators, etc. These materials can easily be entered at time of case entry or any other time by editing the case. Along with case materials, doctors may choose to provide electronic files, such as images, documents, etc. and now they can easily be attached to the case with just a few clicks. Once the electronic file is received, simply edit the case and attach the file to the appropriate Case Number. It is immediately made available system wide and can be opened at any time. Using the brand new ePop notification feature, DLCPM can be configured on a per doctor or per case basis to alert staff while a case is being entered. Your staff will be notified of an important event related to a specific doctor record. When the Alert is received, the doctor record will be automatically retrieved and opened. Once the automated notifications are setup based on the events you specify within the global preferences, you may customize the content of each message generated. Your staff will appreciate these notifications and can help insure customer satisfaction. Instant notifications will improve communication with your doctors and help your staff be proactive with customer support issues. With every case and every doctor, there are always methods or characteristics that are preferred and can become difficult to maintain. DLCPM makes managing even the most demanding of customers’ preferences a snap with a completely configurable list of doctor preferences and very easy to use interface. Each applicable preference is in turn printed on every work order ensuring that every case can be fabricated to the exact specifications of every doctor. For simplicity, these preferences are broken down into four main categories; including General, Customer, Product, and Department Preferences. This powerful search engine will help you to find any case that was ever entered into the Dental Production System using various pieces of information, including Customer ID, Case Number, Patient First, Patient Last Name, Date In, and/or specify a date range for one of the following dates: Ship Date, Due Date, Date Invoiced, or Bill Date. You can search by one or all of these case properties and DLCPM will scan all specified fields in search of the values you enter. Even if you’re not sure of the spelling, only type the first few letters and DLCPM will return all values that start with what you typed. With the DLCPM system, a large number of reports are available with just a few clicks. Anything from Calls Analysis to Shipped Cases to Units Received can be viewed directly from within DLCPM or sent to a printer. Our experts can also create any custom report you may have a need for. Note – Custom Reports can be created by our experts to fit your Laboratory’s exact specifications. The invoicing and shipping module in DLCPM will help streamline the shipping process by providing all necessary functions in one central system, including applying a discount or other case modifications, print the invoice, retrieve a shipping label from the correct carrier, and add the invoice to the accounting ledge for that doctor. You can now accomplish everything you need to ship a case without leaving your seat. Scheduling pickups and invoicing cases has never been easier as DLCPM Enterprise can connect directly to UPS, FedEx, and Puralator, schedule the pickups, and retrieve the shipping label with the proper billing information filled out in real time. Your staff can now either choose to print the shipping label themselves or check the option to have the label Emailed directly to the customer. Also, as a case is invoiced the same process is used to retrieve a valid tracking number and label and is immediately printed out in real time. Without leaving your seat, you can verify location, production status, billing status, track a case that has already been shipped, or even view the RX image all while the doctor is on the phone with your staff. Imagine being able to let your doctor know instantly as they call you that their case is currently in QC and is scheduled to ship today or has just left the opaque room and should be ready to ship in 2 days. DLCPM puts all of the necessary information in one place right at your fingertips including Case Tasks, Case Tasks Log, Case Products, and even Case Comments. As a result of such tight integration and superior design, with just a couple clicks, your staff can reference all of this case information in seconds as it occurs throughout your lab and processed by your technicians. One of the most powerful tools in providing complete customer satisfaction to your doctors is the Calls and Call Notes Management module. This module allows your staff to track all doctors’ activities and incidents every time they contact your laboratory for any reason in the form of Calls and Call Notes. If the issue is not fully resolved, DLCPM allows you to assign incomplete calls to specific users or departments by sending along the entries in the Call Notes history. Anyone can add notes or complete the call as necessary while DLCPM tracks all activity automatically to the Customer record, making it available with a couple of clicks. As a part of your laboratory’s process management, DLCPM will allow your staff to also assign any call to a general department or group. This will ensure that customers are always supported and that nothing ever falls through the cracks. With complete documentation and department accountability, all tasks and issues can be easily addressed in a timely manner. The ground-breaking Call Notification System further enhances the call management system allowing users to create alerts using different delivery methods including E-mail, Text Messaging, or the brand new ePop Call Alert. Specify who should be notified and whenever a new call is created the notified user will receive a notification window that will have the various options that will help them address the issue. Alternate Phone Numbers – Yet another way to support your doctors is the ability to maintain as many Alternate Telephone Numbers as you wish and relate them to a particular doctor record. Always be able to contact your doctors at any time with this feature. Affiliations and Members – You can also keep track of any and all organizations or other affiliations that your doctors may belong to as well as the current membership numbers. For example, if you wish to keep track of the fact that one of your doctors is a member of the ADA and AGD associations, DLCPM makes it easy to simply click the Add button and enter the appropriate information. Staff Members – DLCPM also makes it easy to keep track of every employee of your doctors’ office your lab personnel may have ever dealt with over the course of a business day. It is now possible to know the name and position of someone at the doctor’s office needed to resolve any issue that may come up. In conjunction with the powerful calls feature, you can count on ending the guessing game for the proper contact at your doctor’s office. With this feature, you will know the name, position and contact information for any employee at any given moment. Contacts – Yet another way DLCPM provides complete customer information is the ability to record an unlimited number of contacts or associates. Anyone that may work with or share clients with any doctors’ office can be recorded separately and will be permanently attached to a doctor record. This unique feature allows you to enter custom education courses and track each doctor’s attendance and participation for use in marketing promotions or any other events you wish. Marketing Campaign Manager – First decide the email and query you wish to use and DLCPM does the rest by sending and tracking the correspondences for each doctor involved. Taking this valuable feature a step further, DLCPM breaks new ground with the ability to create Marketing Campaigns and track their performance. Simply create a Campaign ID and associate every Mass Printing of any letter or Email you wish to count towards that campaign and DLCPM tracks all this information to each doctor record involved and makes it available to all staff. Broadcast Email – Utilizing our built-in html editor and the elegant template designer , it’s never been easier to create standardized email templates, instantly send email to thousands of doctors and track all of this activity in one program. Your customers will be impressed by the full support of HTML graphics, electronic file attachments, and full mail merge capabilities. Correspondence Tracking – DLCPM introduces the ability to create, publish, and track all marketing letters and emails that you wish to send to your doctors making it easier than ever to know what discounts and promotions your lab is currently honoring while standardizing your laboratory’s communications with your doctors. For those communications that you may want to resend or may send periodically, there is a feature that will allow you to create templates and store them in the system. This will help standardize your correspondences with your doctors and are very effective in providing a quick and easy way to send first case letter, discount offers, cross sell, collections notice, and much more. DLCPM allows users to decide the values for all drop down lists throughout the application. 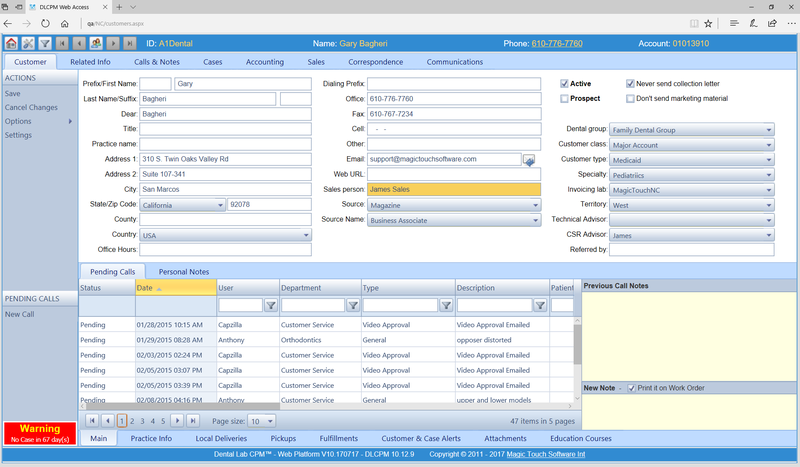 For example, you can specify what types of Call Descriptions will be available to your customer service representatives. If you find you are receiving more and more calls of a new variety, you will find it takes no time to add a new Call Description and have it instantly available company wide. There are dozens of application values and options that you can customize in seconds as you see fit for your laboratory. A complete solution for all Dental Lab needs.